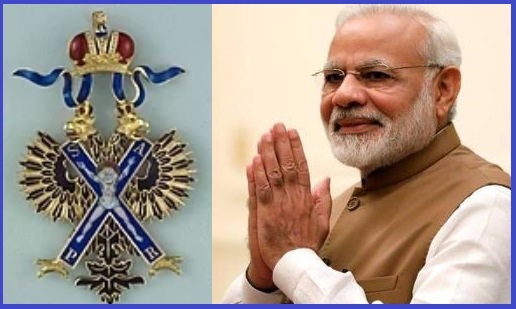 Indian Prime Minister Narendra Modi will be conferred with Russia's Order of St Andrew the Apostle, the highest order of the Russian Federation, for promoting partnership and friendly relations between the two countries. PM Narendra Modi has been decorated with the order for exceptional services in promoting a special and privileged strategic partnership between Russia and India and friendly relations between the Russian and Indian people. The information was shared by the Russian Embassy in India. With this, PM Narendra Modi has now been honored with around seven top global awards. The Indian Prime Minister has previously been awarded the top honour of the United Arab Emirates, the Order of Zayed, as well as of countries including South Korea, Saudi Arabia, Palestine and Afghanistan. The Order of St Andrew the Apostle is both the highest and the oldest state decoration of Russia. It was established as the first and highest order of chivalry of the Russian Empire in 1698 but was abolished under the USSR in 1918 before being reinstated as the top Russian order in 1998. The Order of St Andrew the Apostle is awarded to prominent statesmen and public figures, eminent representatives of science, culture, the arts and various industries for exceptional services, for promoting the prosperity, grandeur, and glory of Russia. Earlier in 2017, Chinese president Xi Jinping was awarded the Order of St Andrew the Apostle.